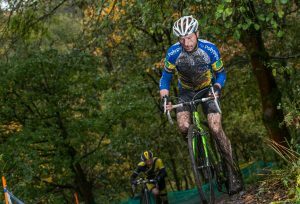 Alderney Baker and Simon Wyllie conquered the muddy conditions to clinch the men’s and women’s events in the fifth round of the West Midlands Cyclo-Cross League at Baggeridge Country Park in Dudley. Wet weather on the weekend and day of the race changed the course into a slippery and muddy one which included wooded and hilly grass sections which tested the rider’s technical abilities. Halesowen A&CC rider Wyllie who finished third in the previous round was locked in another battle throughout the senior race with fellow junior rider Daniel Barnes (Lichfield City CC). Toby Barnes, who has won three of the opening four rounds was forced to miss the race after suffering concussion on a training ride. It was his younger looked to bring the victory back in Lichfield and opened a gap on Wyllie in the opening exchanges as his rival suffered an early puncture. However, National Under-16 Cyclo-Cross Champion from last season Wyllie, from Worcester, worked his way back up to the leader as the junction was made half-way through the race. As they approached the finish Barnes tangled with the course tape and despite riding back up to his rival Wyllie timed hid sprint to perfection and took victory. “After my puncture I was a bit worried that I wouldn’t get back to the front as I didn’t feel that good,” said Wyllie. “On one of the off-camber corners coming into the finish I took a different line to Dan which was faster and he tangled with the tape so lost time. 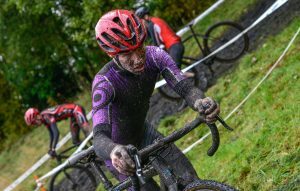 Both Barnes and Wyllie have been selected to ride for Great Britain in two international races in Belgium this weekend. Behind fellow junior Matthew Kingston (Lichfield City CC) initially led the chase but the experience of Ewan Grivell-Mellor (Mid Shropshire Whls) eventually came through to take third. Darren Atkins (Zannata Ride Coventry X Gear) once again took a clear win by nearly two minutes in the veteran’s 40-49 category. The battle behind was led by Nicholas Popham (Rotor Race Team) in second while Jason McNulty (Royal Leamington Spa CC) finished third. The women’s race was another battle between two junior riders who left their more experienced rivals behind to fight out the win. Unlike the men’s event Baker, 18, from Brackley, showing her power to gap Josie Nelson (RST Racing Team) in the last few laps to win by 43 seconds. Alderney Baker on her way to winning the women’s event. Behind Baker’s Team Empella Cyclo-Cross.com team-mate Xan Crees came home in a comfortable third place. 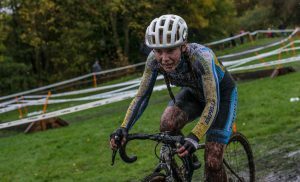 Isla Rowntree (Islabikes) once again thrived in the muddy conditions to come home first veteran rider ahead of Karen Summers (unattached) in second and Amanda Whitehouse (Stourbridge CC) in third. “I had an absolute nightmare from the start as I didn’t hear the whistle so was near the back of the field,” said Baker. “It only took me a few corners to get back to the front though. It was quite a technical course and it was very fun to race on and was different to a lot of courses. Stephen Knight (Team Jewson MI Racing-Polypipe) continued his perfect record in the veteran’s over-50 category by riding clear once again. Stephen Knight on his way to winning the veteran over-50s race. On this occasion he was joined by team-mate Mark James during the opening exchanges before drawing out a winning margin. James came second while Glenn Coltman (Leicestershire Road Club) led the chasers home for third place. After narrowly finishing second in the previous two rounds local rider Ben Askey (RST/Cycle Division got the win he desired in the under-16 youth boy’s event. Despite Askey taking the lead early on he was kept at a dozen seconds by Alex Barker (Team Backstedt/Hotchillee) before pulling away on the last lap. Sullivan Berry (Redditch Road & Path CC) saw off a challenge from quickly closing under-14 winner Max Greensill (Rapid Race Products) for third overall. Greensill had started almost a minute behind the older riders before working his way through the field. Spencer Corder (Rotor Race Team) was second under-14 while Thomas White (Wolverhampton Whls) finished third. Grace Lister (Wolverhampton Whls) used her local knowledge to dominate the under-16 girl’s event ahead of Daphne Jones (Mid Shropshire Whls) in second and Isla Mason (Team Empella Cyclo-Cross.com) in third. Ellie Swingell (Halesowen A&CC) road strongly to finish fastest under-14 ahead of Rebecca Woodvine (Mid Shropshire Whls) in second and Hannah Cockroft (unattached) in third.